Back in November, Marvel confirmed that they are teaming up with Netflix for new TV shows based on comic book characters Daredevil, Iron Fist, Jessica Jones and Luke Cage, which will lead into The Defenders mini-series. Marvel Entertainment's Chief Creative Officer Joe Quesada revealed on Kevin Smith's Fatman on Batman podcast that these shows will all exist in the Marvel Cinematic Universe, while teasing the release plans and the production status of these programs. 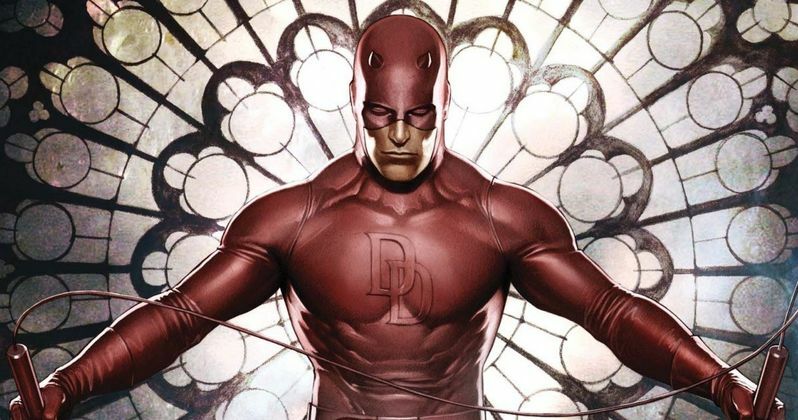 It was assumed by many that Daredevil and the other shows will be set within the MCU, but it has never been confirmed until now. "There will be some interconnectivity, much like the movies. They will exist within the cinematic universe again, so this is all the same world as (Marvel's Agents of ) S.H.I.E.L.D. and The Avengers." The initial anouncement revealed that the shows will debut sometime in 2015, but it wasn't known if Netflix planned on staggering the release of each show. Joe Quesada confirmed that all four shows will be available at the same time, although a specific release date has not been given. "You're going to get all these episodes, and you can binge watch them however you want, and then binge watch them again." He also confirmed a report from February that these programs will all be shot in New York City. "We're shooting in New York. That's the fantastic thing about it is that we're shooting at home. We're shooting where these characters belong. These stories take place in Hell's Kitchen. It thrills me to no end to have these things happening in New York. That alone is going to give it an incredible vibe. It's just once again...it's like Marvel taking ownership of New York, saying this is where we're from, this is our universe, this is where it started." The executive also revealed that the show would be shooting in Brooklyn and areas of Long Island that still look like the old Hell's Kitchen. When asked about Daredevil's setting, he had this to say. "It smells of dark alley, vomit, and piss." While the shows will be set in the MCU, he said they will show a "street level noir" side to these characters fans haven't seen before. "Although these are superhero stories, this is different now. This is the street level...this is the street level noir side of the Marvel Universe. Something that you haven't really, really seen in any of our Marvel movies. And probably more ground level, than I think you've seen. This is not like us doing Batman, Dark Knight or any of that stuff. This is very Marvel doing street level superheroes." He also spoke briefly about the production status of Daredevil, revealing that the scripts by writer-director Drew Goddard and his team are starting to come in. "The scripts are coming in. They are pretty fantastic. They're really emotional. They're very, very original. But at the same time, it is Daredevil. It is Matt Murdock. We will eventually, hopefully start casting really, really soon, but I'm very, very excited about it." Earlier this month, we reported that Marvel has the rights to iconic Daredevil characters Kingpin and Elektra. When asked who the villain of this show will be, Joe Quesada would not say. "I'm not going to say who the villain is in our story." Daredevil, Iron Fist, Jessica Jones and Luke Cage will debut on Netflix sometime in 2015. Are you more excited for these shows now? Chime in with your thoughts below.